If you follow Madison Street all the way from downtown, you eventually reach Lake Washington, and the grassy slopes of Madison Park leading down to the water. The neighborhood and the park share a name and a calm atmosphere, appreciated by families and couples, young and old. Across the lake, you see Bellevue, but the Seattle skyline to the west is obscured by hills and trees. The residential streets that curve and splinter off of the Madison Street thoroughfare are quiet and lined with gorgeous cottages and mansions. 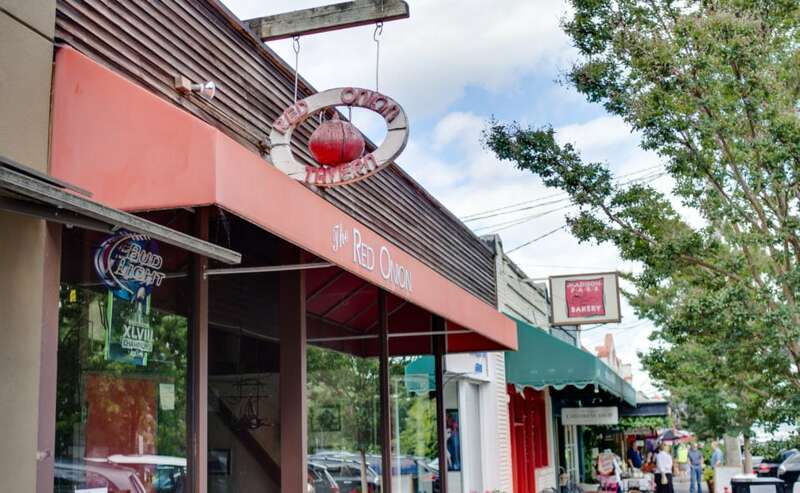 The area around the park itself is a pocket of boutiques, family-friendly shops and a few more chichi bistros. At the west end of the neighborhood, where Madison Street intersects the Lake Washington Boulevard (and the entrance to the sprawling Washington Park Arboretum), you find another cluster of shops, bakeries and restaurants, including Nishino, a destination for sushi aficionados, and just a little further up the hill in the adjacent Madison Valley neighborhood you find even more shopping. Madison Park is beloved by summer visitors who lay out by the water, but residents still get to appreciate a quiet but engaged community year-round. It feels like a bit of a refuge from downtown without ever feeling isolated. Canopy Blue: Boutique with a bright, Mediterranean-inspired interior filled with designer womenswear and accessories. Belle Epicurean: A bakery and cafe serving French pastries in a beautiful, old-world atmosphere. Madison Park: Beautiful views, summer swimming and play areas for kids on 8 grassy acres along Lake Washington. Nishino: Casual in style, but serious about sushi and sashimi, it's one of the best Japanese restaurants in town. Bing's: Craft cocktails and wine, plus truly yummy bar bites (a steal during happy hour), with patio seating available.